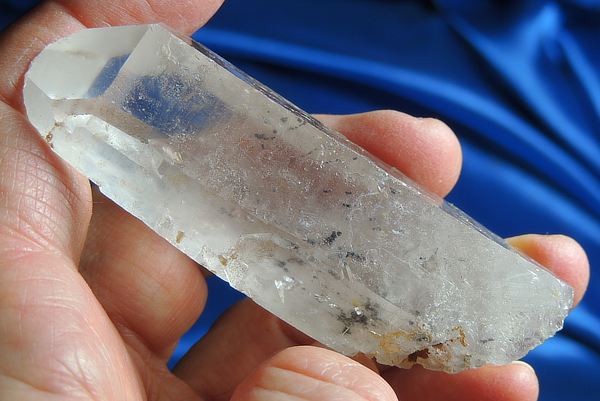 This is an opalescent quartz with slanted and healed base from Brazil, 1.9 oz and 2.95" by 1" by 0.8". He is very pale smoky and more clear than pictures show as his sides bear amazing glyphs or keys. One side is sparsely populated with tiny students while the rest hold the Sirius starbrary glyphs. And as I worked with him, I noticed specks inside … they are tiny hematite dendrites, all arrange in bead-like manner! Although there are a few tiny dings, he is incredible in his messages and his energy! I guarantee that he will take your breath away when first you open him! He has a few tiny dings, but nothing altering his energy or message.